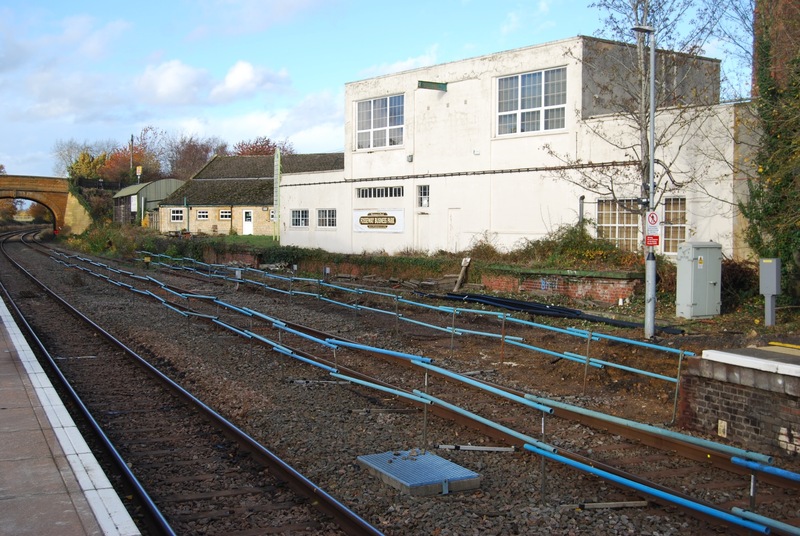 A nine-day closure of the Cotswold Line between Moreton-in-Marsh and Worcester during work to lengthen station platforms began on Saturday, November 17. Contractors are working around the clock at Honeybourne, Evesham and Pershore stations to make all the platforms long enough to allow doors to be opened on seven coaches of nine-coach and 10-coach InterCity Express Train (IET) formations operated by GWR. Work is also continuing overnight at Moreton-in-Marsh, Charlbury and Hanborough stations to extend their platforms, with train services continuing to operate the rest of the day between Moreton-in-Marsh and London Paddington. The picture above shows safety fencing in place around the area where the north end of platform 2 at Moreton-in-Marsh will be lengthened. An hourly rail replacement bus service in each direction is operating between Moreton-in-Marsh and Worcester, calling at the intermediate stations, during the shutdown on this part of the route, which will continue until Sunday, November 25. Normal train services will resume on Monday, November 26. A limited number of extra peak-hour trains are running between Worcester and London via Stroud to maintain direct rail links with the capital for Worcester passengers while the Cotswold Line route is not available. Other improvement work is taking place alongside the extension project at Moreton-in-Marsh, with new drains being installed on the existing platforms. These will also be resurfaced. Construction of the new waiting room on platform 2 is continuing, with the roof and walls being installed. It is hoped the building will be completed and available for use by passengers at some point in December. Passengers using Moreton-in-Marsh station until Sunday, November 25, should note that fewer car parking spaces are available than normal, due to the need to provide space for the rail replacement bus services to run round and access for the contractors working at the station. Click here for more details and information about replacement buses and alternative rail routes that can be used during the closure between Moreton-in-Marsh and Worcester. Times of trains operating east of Moreton-in-Marsh should also be checked before travel, as some services are slighttly retimed. Click here for more pictures of the work at Moreton-in-Marsh, taken by William Crossley.